For his 1948 painting, “The Dugout,” Norman Rockwell had the opportunity to work with professional models — professional ball players, that is. For over twenty years a silent killer stalked the White House. Was this killer responsible for the death of three presidents? The latest study on eggs may have you rethinking your breakfast. Read More about Your Health Checkup: Should I Eat Eggs for Breakfast? Today would be the 100th birthday of Virginia O’Brien, the frozen-faced actress of ’40s MGM musicals with comic timing that was all her own. 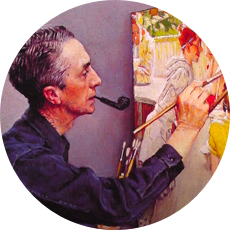 Norman Rockwell’s work, once scorned as kitsch by art critics, now sells to collectors like Steven Spielberg for tens of millions of dollars. Historian John McManus explains how the invasion marked a turning point in America’s relationship with the rest of the world. 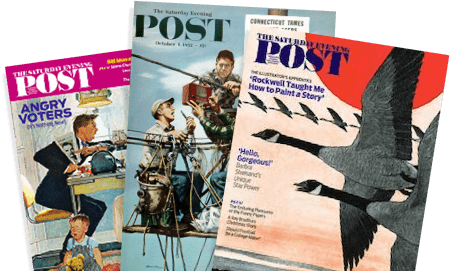 Get a cover-to-cover look at the Post's most memorable artwork. Learn more about The Post's most beloved artist. Neysa McMein was famous not only for her paintings of stylish women of the 1920s, but also for the remarkable company she kept. Why Was There a Post-World War II Beard Boom? Enjoy unlimited access and exclusive membership benefits. The Saturday Evening Post offers its readers a thoroughly American take on vital issues of the day. If you already have a subscription then verify your existing subscription for access. These cartoons from the mid-century show Americans’ brand-new love/hate relationship with television. What did people do before TV, texting, and twitter? They played cards! These cartoons from the 1940s take you back to at a time to when “no trump” had a whole different meaning. Opening Day of Major League Baseball is here, so we’re offering a little humor to go with your home runs!